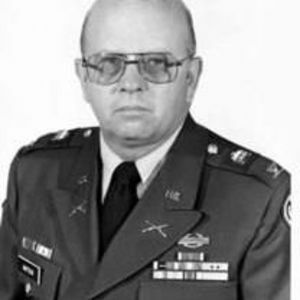 Colonel William (Bill) Talmage Watson, Jr., (USAR ret.) received his final orders on Sunday morning, October 29, 2017. Bill was born June 25, 1929, in Nash County, NC to the late William Talmage Watson, Sr. and wife Lucille. He retired from the US Army Reserve after achieving the rank of Colonel. Visitation will be Saturday, November 4, 2017 from 10:30-11:00 am at Thomas-Yelverton Funeral Home with a funeral service to follow at 11:00 am. Interment will take place in Arlington National Cemetery alongside his comrades at a later date. Among those left to mourn his passing include his wife Rosalind Watson and sons William Talmage III and wife Sherry and John Thomas Watson and wife Joanne. Online condolences can be made at www.thomasyelverton.com Arrangements been entrusted to Thomas-Yelverton Funeral Home, Wilson, N.C.